Potassium is a mineral that plays a role in supporting healthy nervous system, cardiovascular system, blood pressure, fluid balance and enzymatic reactions in the cells.† †Results may vary. Dr. Hans Nieper, a german physician and innovator of "Active Mineral Transport," combined potassium and magnesium orotates to treat cardiovascular diseases. Other applications include wound healing, immune enhancement, depression and anxiety. Each molecule of potassium orotate consists of a molecule of orotic acid in which one of the hydrogen atoms is replaced by a potassium atom. Orotate (orotic acid) is a biochemical substance made by all living cells. It is a necessary raw material for making the genetic material: RNA and DNA. Potassium is an essential mineral throughout the biological world, and is the most prevalent positive-charged ion in animal cells. This element helps to regulate the amounts of water and electrolytes in cells and plays an important role in nerve conduction and muscle contraction. Orotates are the mineral salts of orotic acid, a natural substance found in our bodies and also in various foods including dairy products. As theorized many years ago by Dr. Nieper, orotates are a component of a natural system of electrolyte carriers for distributing minerals throughout the body. A different compartment of this same system uses amino acid complexes such as aspartates and arginates to deliver minerals.) Based on his observations of cells in culture, Nieper concluded that molecules of calcium orotate and magnesium orotate can pass through cell membranes intact without “dissociating” or breaking apart into their component ions, and thereafter release their respective ions only at specific membrane sites within the cell. Subsequently he extended this principle to include other orotates such as lithium and zinc. Although not an antioxidant itself, potassium orotate facilitates the tissue uptake of vitamin C from serum and increases blood levels of reduced glutathione. Potassium deficiency is not considered to be common in view of the availability of adequate amounts of this mineral in most diets. Nevertheless, potassium deficiency is known to arise as a secondary consequence of magnesium deficiency. Another cause of deficiency is the use of potassium-wasting diuretics to control high blood pressure. Disease states known to be associated with low serum or tissue potassium include diabetes, insulin resistance, and high blood pressure; as well as rheumatoid arthritis, and heart disease. Dr. Nieper's original motivation to develop orotic acid as an electrolyte carrier was inspired by results due to E. Bajusz showing that potassium orotate can prevent idiopathic myocardial necrosis in hamsters, while potassium chloride is ineffective. Nieper subsequently found that potassium orotate was highly effective for promoting human cardiovascular health when combined with magnesium orotate (see discussion in the section below on Magnesium orotate). Even when administered by itself to heart attack patients, potassium orotate has been reported to result in faster recovery of myocardial contractibility than placebo. Other reported applications for potassium orotate include acceleration of wound healing and enhancement of recovery and immune function following surgery. Although not an antioxidant itself, potassium orotate facilitates the tissue uptake of vitamin C from serum and increases blood levels of reduced glutathione. Finally, studies in animals have revealed antidepressant, psychostimulant, and anxiety-reducing effects associated with chronic potassium orotate administration. Percentage Daily Values are based on a 2000 calorie diet. *U.S. RDA not established. Other Ingredients: Provsolv, Pure Food Glaze, Avicel, Cab-O-Sil. Does Not Contain: Sugar, Starch, Yeast, Sodium, Wax, Wheat, Rye, Oats, Barley, Buckwheat, Spelt, Soy, Dairy, Eggs, Corn, Sulfites, Sulfides, Artificial Coloring or Flavors. *Dr. Hans Nieper was very particular when ti came to selecting ingredients and insisted we use his complex and multi-step manufacturing processes. He said no other company in the world would bother to go to the expense necessary to do it correctly. He was quite aware that several formulators and fillerswere using ingredients that he had mentioned in his lectures, but he never gave his formulas to any of these "get rich quick copy cats," as he called them.He knew they would take short cuts and not follow his specified formulations properly -- even if they were able to find out how. Only Dr. Nieper could guarantee results and he spent his whole life perfecting his formulation and products. As an addition to the daily diet, take one capsule daily or as directed by your health care professional. Consult your health care professional before giving this or any dietary supplement to children. Altura BM, Altura BT. Interactions of Mg and K on blood vessels-aspects in view of hypertension. Review of present status and new findings. Magnesium. 1984;3(4-6):175-94. Durlach J, Collery P. Magnesium and potassium in diabetes and carbohydrate metabolism. Review of the present status and recent results. Magnesium. 1984;3(4-6):315-323. Norbiato G, Bevilacqua M, Meroni R, et al. Effects of potassium supplementation on insulin binding and insulin action in human obesity: protein-modified fast and refeeding. Eur J Clin Invest. 1984;14(6):414-9. Nieper HA. The anti-inflammatory and immune-inhibiting effects of calcium orotate on bradytrophic tissues. Agressologie. 1969;10(4):349-57. Available as article #CM14 from the A. Keith Brewer International Science Library at (608) 647-6513 or on the Web. Bajusz E. Interrelationships between reparative processes in myocardium and the development of congestive heart failure. Rev Can Biol. 1968;27(1):45-60.Tomov L, Kaloianova A. Changes in hemodynamics in acute myocardial infarct following administration of potassium orotate [in Bulgarian]. Vutr Boles. 1976;15(4):79-82. Kolokol'chikova EG, Pal'tsyn AA. Electron-radioautographic study of the effect of potassium orotate on RNA and protein synthesis in fibroblasts during experimental wound healing [in Russian]. Biull Eksp Biol Med. 1983;96(8):115-8. Bilich GL, Nazarova LV, Sungurova EV. The enzymatic status of circulating lymphocytes as an index of the regenerative process in the lungs under stimulation with pyrimidine and purine derivatives. A clinical experimental study. Haematologia (Budap).1982;15(1):71-81. Kuzdenbaeva RS, Kurakina VE, Iztleuov MK. Effect of anabolic substances on the state of the individual components of the glutathione-ascorbic acid system [in Russian]. Farmakol Toksikol. 1980;43(5):607-9. Karkishchenko NN, Khaitin MI. Comparative study of the indices of the antidepressive activity of potassium orotate and piracetam [in Russian]. Farmakol Toksikol. 1985;48(2):32-5. This product is the best product I have found that completely prevents muscle cramping, especially at night. 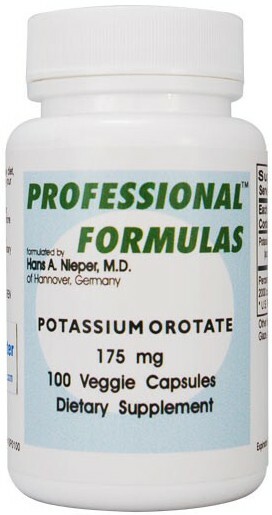 All other potassium products on the market are far lower in the amount of potassium that is in this very bottle. I cannot live without this potassium!